More than 1,000 medications, with acetaminophen being the most common, have been associated with drug-induced liver injury (DILI). Diagnosis can be challenging due to the multitude of contributing factors, and timely recognition and clinical response may mean the difference between recovery and acute liver failure or even death. DILI affects an estimated fewer than 10 people in every 10,000 exposed persons. The condition is dose-dependent or an adverse reaction to a medication, dietary supplement or other substance. "The liver helps remove toxins, which makes it especially vulnerable to injury from either short-term intake above recommended levels or long-term usage that allows toxins to build up," Collins-Yoder said. "Recognizing the clinical signs and symptoms is crucial to prompt treatment and effective patient care." Depending on the contributing factors and the level of damage to the liver, patients with mild and moderate signs and symptoms may recover normal liver function after the triggering substance is identified and use is discontinued. Other patients may experience more severe damage, progressing to acute liver failure. About 46 percent of persons with acute liver failure in the United States have liver damage associated with acetaminophen, making it the most common cause of DILI. Since acetaminophen is often an ingredient in over-the-counter and prescription pain medications, patients may take higher doses than needed. A more infrequent type of DILI is triggered by an adverse reaction to prescription medications, herbal dietary supplements or other substances, including: nonsteroidal anti-inflammatory drugs (NSAIDs), including ibuprofen, naproxen and others; antibiotics and antiviral agencies, such as amoxicillin-clavulanate, sulfamethoxazole-trimethoprim and nitrofurantoin; antileptic agents, such as volproic acid and carbamazepine; statins; novel anticoagulants; proton pump inhibitors; methotrexate; azathioprine; sulfasalazine; herbal and dietary supplements. 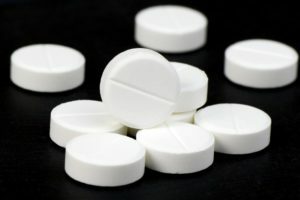 Acetaminophen, found in over-the-counter products such as Excedrin and Tylenol, provides many people with relief from headaches and sore muscles. When used appropriately, it is considered mostly harmless. Over recent decades, the drug, which has been marketed since the 1950s, has become the medication most commonly used by pregnant women for fevers and pain. In a report in the current online edition of JAMA Pediatrics,researchers from the UCLA Fielding School of Public Health show that taking acetaminophen during pregnancy is associated with a higher risk in children of attention-deficity/hyperactivity disorder and hyperkinetic disorder. The data raises the question of whether the drug should be considered safe for use by pregnant women. ADHD, one of the most common neurobehavioral disorders worldwide, is characterized by inattention, hyperactivity, increased impulsivity, and motivational and emotional dysregulation. Hyperkinetic disorder is a particularly severe form of ADHD. The UCLA researchers used the Danish National Birth Cohort, a nationwide study of pregnancies and children, to examine pregnancy complications and diseases in offspring as a function of factors operating in early life. The cohort focuses especially on the side effects of medications and infections. The researchers studied 64,322 children and mothers who were enrolled in the Danish cohort from 1996 to 2002. More than half of all the mothers reported using acetaminophen while pregnant. The researchers found that children whose mothers used acetaminophen during pregnancy were at a 13 percent to 37 percent higher risk of later receiving a hospital diagnosis of hyperkinetic disorder, being treated with ADHD medications or having ADHD-like behaviors at age 7. The longer acetaminophen was taken -- that is, into the second and third trimesters -- the stronger the associations. The risks for hyperkinetic disorder/ADHD in children were elevated 50 percent or more when the mothers had used the common painkiller for more than 20 weeks in pregnancy. "It's known from animal data that acetaminophen is a hormone disruptor, and abnormal hormonal exposures in pregnancy may influence fetal brain development," Ritz said. Acetaminophen can cross the placental barrier, Ritz noted, and it is plausible that acetaminophen may interrupt fetal brain development by interfering with maternal hormones or through neurotoxicity, such as the induction of oxidative stress, which can cause the death of neurons.